On some platforms, for example on the Macintosh and Microsoft Windows, the operating system's file system browser can be used to copy folders and files from the file system into the Workbench. Note: The resource(s) must be dragged to the exact location in the hierarchy of one of the navigation views where the resources are to reside; they cannot be simply dragged and dropped onto a blank area in the navigation view. Open the operating system's file system explorer. Locate the file JanesFile.txt that was recently exported and drag it to a specific location in one of the navigation views in the Workbench. A dialog appears that allows to determine how the file will be added to the project, either as a simple copy of the original file or as a link file. When dragging resources into one of the navigation views, the project/folder that the resource is being dropped into will be selected. Drag the file over JaneQUser2 and release the mouse button. Notice that the file is copied into the Workbench and placed into JaneQUser2. This can also be achieved by copying the file in the file system explorer, then selecting the destination in the navigation view and choosing Edit > Paste. Generally, files and folders can be imported in a project by making copies under the project folder, or by linking to the original files and folders by creating link files and folders. 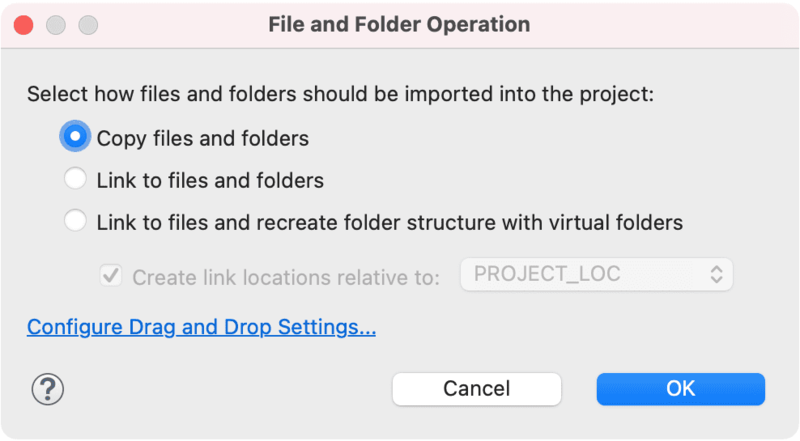 When folders are drag and dropped (not only files), the dialog also allows you to create a project hierarchy with virtual folders. A virtual folder is a folder hierarchy in the Workspace whose files are all links referring to the original file system location.